In 1961, Michael Rockefeller, son of then-governor of New York State Nelson Rockefeller, mysteriously disappeared off the remote coast of southern New Guinea. Amidst the glare of international public interest, the governor, along with his daughter Mary, Michael’s twin, set off on a futile search, only to return empty handed and empty hearted. What followed were Mary’s 27-year repression of her grief and an unconscious denial of her twin’s death, which haunted her relationships and controlled her life. 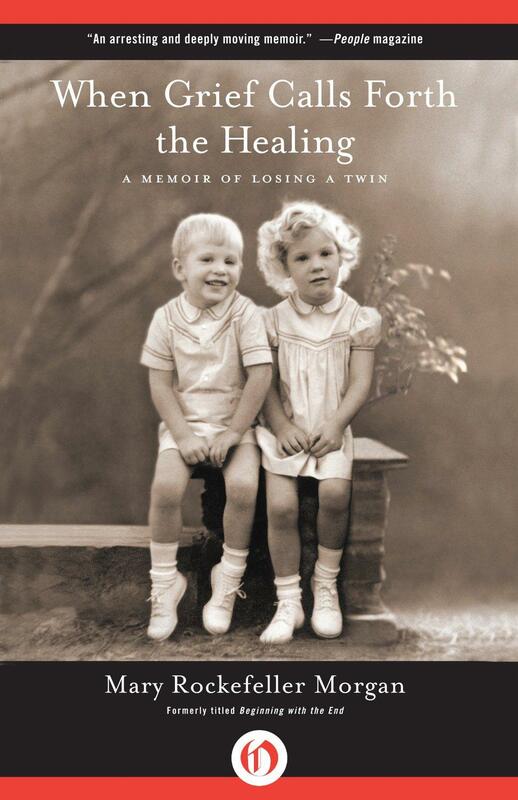 In her frank and moving memoir, When Grief Calls Forth the Healing: A Memoir of Losing a Twin, Mary Rockefeller Morgan struggles to claim an individual identity, which enables her to face Michael’s death and the huge loss it engendered. In the book, she shares her healing journey and her story of moving forward into a life of new beginnings and meaning, especially in her work with others who have lost a twin. Winner of the National Book Critics Circle Award and finalist for the Pulitzer Prize, Blake Bailey has been hailed as “addictively readable” (New York Times) and praised for his ability to capture lives “compellingly and in harrowing detail” (Time). The Splendid Things We Planned is his darkly funny account of growing up in the shadow of an erratic and increasingly dangerous brother, an exhilarating and sometimes harrowing story that culminates in one unforgettable Christmas. On December 14, 2012, Scarlett Lewis experienced something that no parent should ever have to endure: she lost her son Jesse in an act of unimaginable violence. The day started just like any other, but when a gunman opened fire at Sandy Hook Elementary School, Scarlett’s life changed forever. Following Jesse’s death, Scarlett went on an unexpected journey, inspired by a simple three-word message he had scrawled on their kitchen chalkboard shortly before he died: Norurting Helin Love (Nurturing Healing Love). It was as if he knew just what his family would need in order to go on after this horrible tragedy. When journalist Becky Aikman was widowed in her 40s, she felt unmoored. But she couldn’t find the kind of help that she needed, so she dug into the data and eventually created her own unique support system. Her book, Saturday Night Widows: The Adventures of Six Friends Remaking Their Lives, details the trials and triumphs following tragedy — and new research about what really helps the bereaved. Michael Hainey was 6 years old in 1970 when his Uncle came to their home one morning, to tell Michael and his brother that their father was dead. Bob Hainey was just 35. He was the night editor at the Chicago Sun-Times. Bob Hainey had died of a heart attack on a North Side street - as one of the obits put it - while visiting friends. Over the years, Michael Hainey grew up to be a journalist himself - he's now the deputy editor of GQ - and began to wonder about some of the small differences in the obits between newspapers, and about some of the obliqueness in the accounts of his father's death that he grew up hearing from his uncle and mother. So, he set out to find the story himself. His new book is After Visiting Friends: A Son's Story.